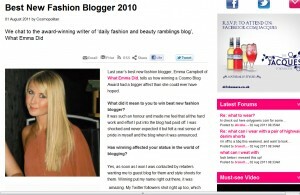 Just a quickie post today to let all you fellow bloggers out there know about the Cosmo Blog Awards 2011. Some of you may know me from my win last year at the 2010 awards, and those who do and who have been reading my blog from then on will have seen the benefits it can give you as a blogger. So my basic point of this post is to encourage any of you up-coming fashion, beauty, lifestyle, relationship bloggers to put yourselves forward! The nominations are soon to be revealed, and if you’re one of the lucky ones to be nominated, then I wish you good luck! I have decided not be get involved this year, winning the best new fashion blog for 2010 was a big enough honour in it’s own right, trying again for 2011 would be ruining the victory I had from the first year. It’s time for some of this years new talen to show your blogging faces! Previous Post Paper Eyelashes – The Next Big Thing?